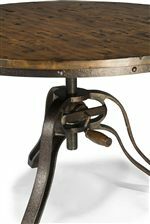 This round top end table exhibits Industrial Revolution attitude with a three-leg and threaded post base. Simply swivel the threaded post to adjust the table height to a range of height settings. Spanning 24-inches in diameter, the round top provides ample area for a table lamp, reading materials and remote controls. Pair this table with others from the same collection for a coordinated set. The Cranfill Industrial Style Round End Table with Adjustable Height by Magnussen Home at AHFA in the area. Product availability may vary. Contact us for the most current availability on this product. T2299-05T Round End Table Top 1 24" 24" 2"
T2299-05B Round End Table Base 1 17" 15" 22"
Welcome updated restoration style into your home with the casual, industrialization era-inspired Cranfill Occasional Table Collection. Cranfill is crafted from select hardwood solids and Aged Pine veneers with patina finished, central threaded posts not unlike those found on turn-of-the-century banker’s stools. Wooden table tops are trimmed by riveted iron for added authenticity. The Cranfill collection is a great option if you are looking for Industrial Mission furniture in the area.